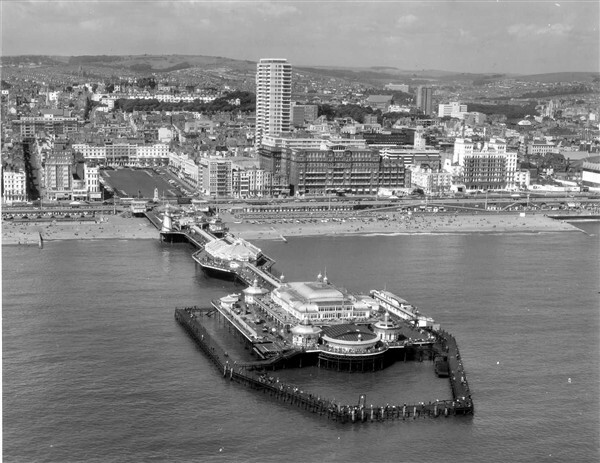 Aerial View of West Pier taken in 1967, not long before it was partly closed in October 1970 as the southern part was assessed to be in a dangerous condition. The West Pier Trust is developing an oral history project. If you or your family have memories of the pier and would like them to become part of a growing archive of reminiscences please contact info@westpier.co.uk or 01273 321499. You will be interviewed and in due course, with your permission, your stories will be made available to hear on the website www.westpier.co.uk . Eventually it is hoped that the oral history archive will be a key part of the exhibition at the proposed West Pier heritage centre. The West Pier Trust are also creating an on-line archive of personal photographs, film and written memories of people who used the pier for pleasure or worked for the pier company. The trust are inviting the public to submit material to show on our website. If you would like to add to this collection please go to www.westpier.co.uk/memories. In the 1970s I lived in Regency Sq and joined two trusts. The West Pier and the Wey and Arun canal trust. The canal trust asked us to save paper, held jumble sales and dances and the money started coming in to buy tools for the job.That trust is still going strong. I was never asked to do anything by the pier trust. Whereas if they had done the same as the canal people, we would still have a lovely pier.